With more road warriors using Airbnb for their business travel, it’s time we take a look at what to pack for Airbnb, and how this differs from hotel stays. If you’re thinking of using Airbnb rather than a hotel for your next work trip accommodation, then you’re joining a growing number of road warriors making the switch. From the comfy atmosphere to extra facilities, there are loads of reasons to book an Airbnb for business travel. 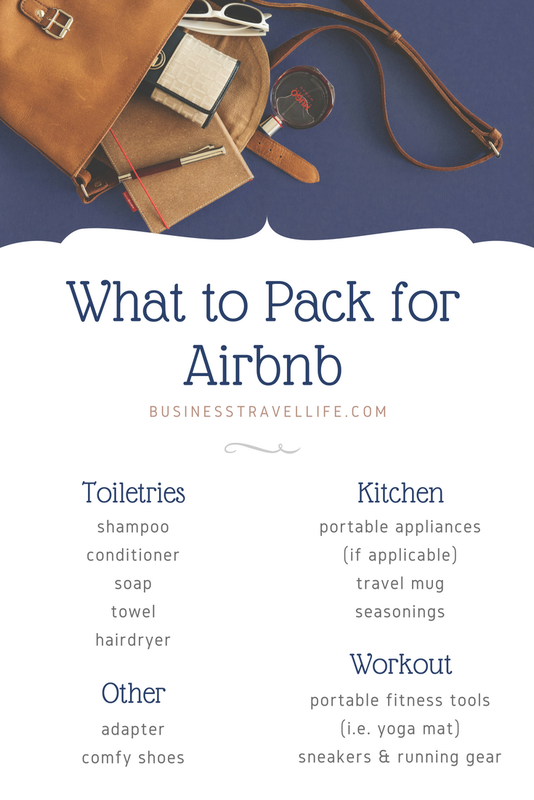 But different accommodations have different amenities, and knowing what to pack for Airbnb will make your experience all the more enjoyable. One tiny drawback to staying at an Airbnb is that soap, shampoo, and conditioner are in no way guaranteed to be included. You can clarify with the host, but count on packing your own toiletries. Luckily, buying reusable travel bottles and using your own shampoo and conditioner costs next to nothing in the long run. Whether or not to bring a towel or hairdryer is a bit more up in the air. Some hosts provide them, others don’t, and there really isn’t a rule of thumb in this regard. Check the listing closely to see if towels and hairdryers are listed as included amenities, and, if not, add them to the packing list. Since most Airbnb hosts offer kitchen facilities to guests, pack some staples to take along. While pots/pans, plates/bowls, and utensils are probably included, check in with the host for more specific items, such as blenders. You can make up the difference by packing a travel-sized version of the missing appliance, or substitute for other healthy meals using the provided tools. Plan for more than core meals, and pack appropriately for your favorite pick-me-ups as well. In other words, if you have a favorite travel mug for your morning coffee, bring it. There’s no need to stop at Starbucks when you can make a cup in your Airbnb kitchen. Additionally, if there are extra substances like seasonings that make frequent appearances in your dishes, it might be more practical to pack a small portion rather than purchase at your destination. As every Airbnb is unique, double-check with your host on what’s available for use and what isn’t before you commence packing. Without a hotel gym, you’ll have to get creative with how you exercise. Luckily, you have more space in an Airbnb than a hotel, meaning you can really move around. Look into some packable yoga gear or other portable fitness equipment. Sometimes, a simple pair of sneakers and running attire will do the trick. Depending on where your Airbnb is located, whether it’s the city center or a quieter neighborhood, you might enjoy a simple jog and getting to explore more of your destination. While some hotels provide spare adapters in case a guest forgets theirs, Airbnb hosts usually don’t. As such, remembering an adapter is pretty important for international business travel. Casual shoes should also be on your list. Socks usually do the trick for navigating a cramped hotel room, but when you’re free to roam almost an entire home, you’ll be grateful to have comfy footwear that guards your feet against a kitchen mess or slippery hardwood floors. That’s the long version of what to pack for Airbnb, and below is the short version. Never forget the extra essentials with this Airbnb packing list.